← How awesome was this?!? Play that funky vinyl, D boi! Just wanted to check in with y'all to let you know that you can get your own #PostcardsInTheSky on vinyl! They'll be available at my upcoming shows so be sure to check them out… and don't worry, we''ll be selling 'em on our website soon so everyone has a chance to get one! I, personally, am MUCH too young to remember “big size albums” and absolutely 100% don’t still have the Consumers Distributing turntable on which some people played Jackson Browne and Linda Ronstadt and Poco albums (both sides) nonstop and obnoxiously sang along at full blast to get over that jerk in Russell House who only danced with your roommate for the ENTIRE frosh party. But I have heard through the grapevine that EVERYTHING sounds better on vinyl so I can only imagine (see what I did there? heh) how mind-blowing a Postcards in the Sky vinyl will be. If you’ve already picked one up at a show… please share how amazing it is! And praise be that it will be available on the OS!!! IT’S LIKE CHRISTMAS IN JULY!!!!!! Watching David open a vinyl album like it’s some ancient artifact from prehistoric times was well, hiLARious… but seeing his enthusiasm over such a retro, hipster throwback absolutely made my day. It also made my day that he’s “just checking in” every now and then… no more, no less… just checking in… LOVE IT!!!! Sat here thinking….right now in the old days maybe he’d still be “waiting for clearance from the big guys” to decide if “vinyl was a good investment…good idea…doing market research first”…instead….boy is FREE free freeeeeee to be as happy as he is in this little ole ADORABLE (did I mention that?) IG post! Today while giving high school students a tour of the Archives one asked what the microfilm reader was. He then realized "Oh, that's what people use in horror movies to find out the scary history of the town." WHAT. A. HOT. TAKE. 12 Responses to Play that funky vinyl, D boi! How much fun can one singer be during times when he isn’t actually singing? This had every bit of the anticipation and excitement that comes with opening a time capsule. My first reaction was hobble over to my remaining vinyl LPs and relive a few memories while I still can. I will definitely add David’s “big size album” to my collection. How many times have I watched the video? I am not ready to answer that yet. I can’t wait to buy this!! Gave away my stereo years ago but I don’t care! YESSSS!!!! aMAZing Poco harmonies!!! And even though Jim Messina went on to become half of Loggins & Messina, my heart belonged to Poco, lol. *high-five* Sheila! and this is cool, thanks, Gwen!!! cid:209913A8-8845-4F13-8B25-66C402240F37 …I’m trying to see if this pic will post….it’s my turntable…I’M READY and Waywaywaitinnng..(see what I did there?) (ok, kinda lame but..) Postcards is going. TO. BE. AweSOMMMMME on vinyl! Anyone check OS….is it out yet?!! lol. And that video…luckily after I watched it 3 times in a row, I had to run out for a bit or I’d have an embarrassing amount of times to report ….just watched again though. It makes my heart grow a few times larger just watching him hold that big ole record, and describe listening “the old fashioned way”haha. …snap, crackle, pop before the album would start up and take you on complete journey…(ya know…JUST LIKE old school hipster David’s albums do)…David, and his REAL, organically gorg vocals, and his old school vibey, “groovy” sensibility in Postcards…perfect pairing for vinyl! I could NOT get enough watching how genuinely happy and excited and sweet he was presenting it. Not to mention…lookin’ spiffy. Did he purposely dress in that (uncharacteristically dark) shirt to match the album? Good move. A FREE free freeee David is how he need to be creatively. So happy for him. So happy for us. …there she is….just waitin’…..lol, tks Deb for the techy help. Yes, made me chuckle a bit with D talking about ‘your parents and grandparents’. Well that may be the case for many of course but some of us actually played vinyls back in the day, haha. Still have most of my collection of vinyls actually. No longer have a turntable to play them on but would love to get a copy of PCITS in vinyl, nice! Think it’s a great idea for this album. This is a most delightful video and I can’t wait to get my own 33 of Postcards. Who else is old enough to remember when we called them 33’s (and optionally 1/3) to differentiate them from 45’s and 78 RPM records (vinyl? bah, that name’s for you young ‘uns)? David, I am delighted to hear that you are going to sell them on your website! Who knows when you’ll do 4 or 5 more concerts here in Washington? (shameful bragging) So I appreciate the access to this lovely collector’s item.Which may or may not be framed and hung on the last remaining square foot of wall space in my home. 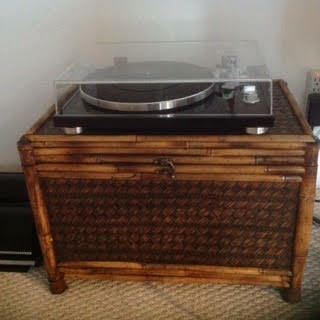 We do have a turntable which (ready for it) makes analog tracks into digital recordings. Yep, we’re so far out of fashion, we’re the opposite of fashion. A clip of Madilyn Paige’s new song with David!